All you are well aware of the importance of equity in your portfolio. Though it bears the risk of losing the capital you need to have some portion of equity in your portfolio to beat the inflation. An early start to invest in a mutual fund SIP helps you to reach your financial goal easily. Those who are new to the mutual fund and looking for best funds to invest can read this article Top 10 mutual funds for SIP to invest. Asset under Management (AUM) size is to be more than 500 cr as higher the AUM means it has gained the investors’ confidence to put the money in those funds. Presence of at least 5 years in the market. A 5 years presence in the market signifies that it is time tested across various market situations. Past annual return of more than 15% for 5 years. It means the fund is present in the market with stellar performance. At least 4 star rating from valueresearchonline and Morningstar India. Higher rating indicates that the funds can perform well with respect to the others. I have not segregated across the fund categories, Large Cap, Mid cap and Small cap funds. All types of funds are included in the list. I have taken the data for regular plans. As you are already aware, you can invest in direct plan of these funds. In this regard, you may be interested about switching the regular funds to direct plans. 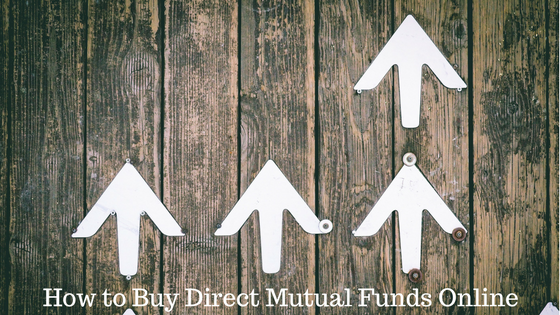 Here is the guide how you can switch the fund from regular to direct plan. 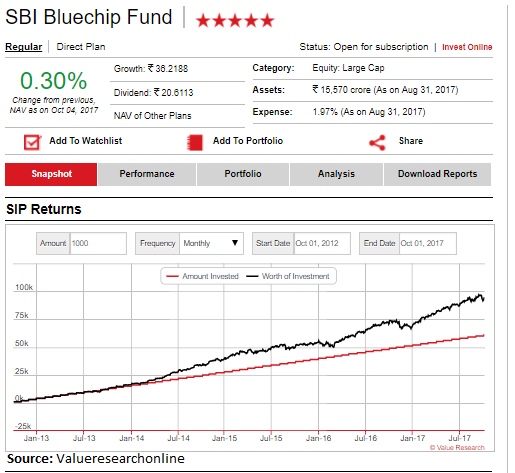 Mirae Asset Emerging Bluechip is a fund which invests in the stocks of market capitalization of over Rs 100 crore and not in the top 100 stocks in market capitalization. The past performance of this fund is consistently good. It has generated a return of over 29% for a period of 5 years. The expense ratio for regular plan is 2.4%. It has continuously beaten the benchmark Nifty Free Float Midcap 100. If you invest Rs 1000 per month for a period of 5 years (means Rs 60,000) , the investment is now worth of Rs 1,28,000. The rate of return since launch is 23.9% which is quite good. The fund holds its 4% asset in the Indusind Bank. It has allocated its investment across different sectors. The minimum SIP amount is Rs 1000 and exit load is 1% for redemption within 1 year. This fund has secured an asset size of Rs 4305 Cr. 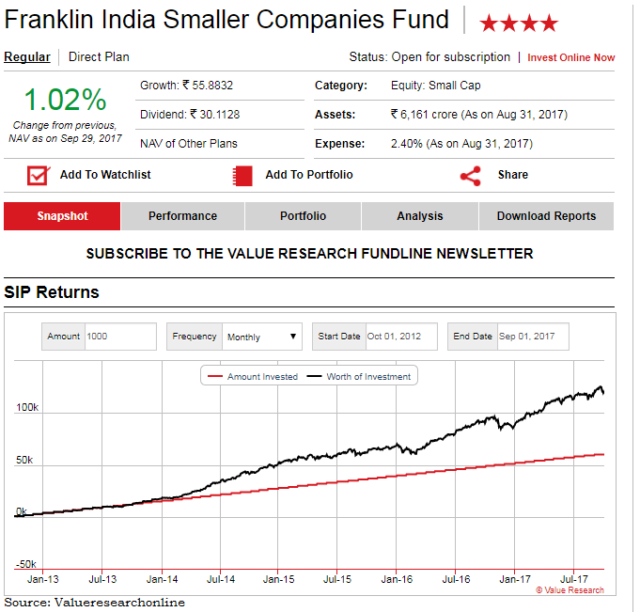 Franklin India Smaller Companies is a small cap fund which is investing in mid and small cap companies. The fund invests a minimum of 75% of its assets in smaller companies. The fund is a continuous performer in the small cap segment. It has generated a return of over 29% in 5 years period. The expense ratio for regular plan of the fund is 2.49%. 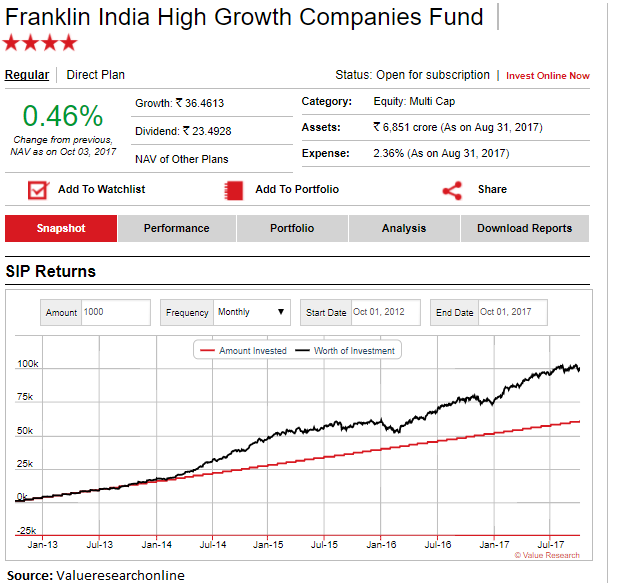 The benchmark index of this fund is also Nifty free float midcap 100. If you have invested Rs 1000 per month for a period of 5 years you get Rs Rs 1,10,000 for an investment of Rs 60,000. It has the highest asset (3.66%) allocated in the FInolex cables and allocation of asset is well diversified across the sectors. The minimum SIP amount is Rs 500 and exit load is 1% for redemption within 1 year. This fund has secured an asset size of Rs 7000 Cr. 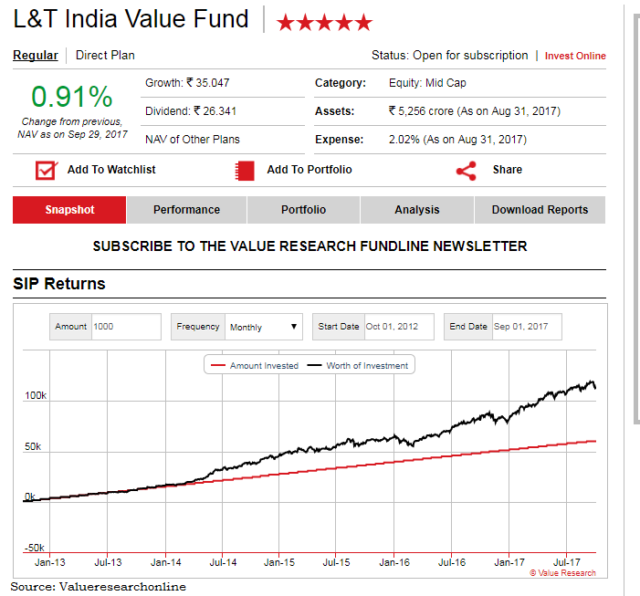 L&T India value Fund is a midcap fund which invests primarily in Indian market with higher focus on undervalued securities. The fund is a continuous performer in mid-cap category. It has generated a return of 20% or more in 1 year, 3 year and 5 year period. If you have invested Rs 1000 per month in SIP of this fund you would have saved Rs 1,13,657 by now. 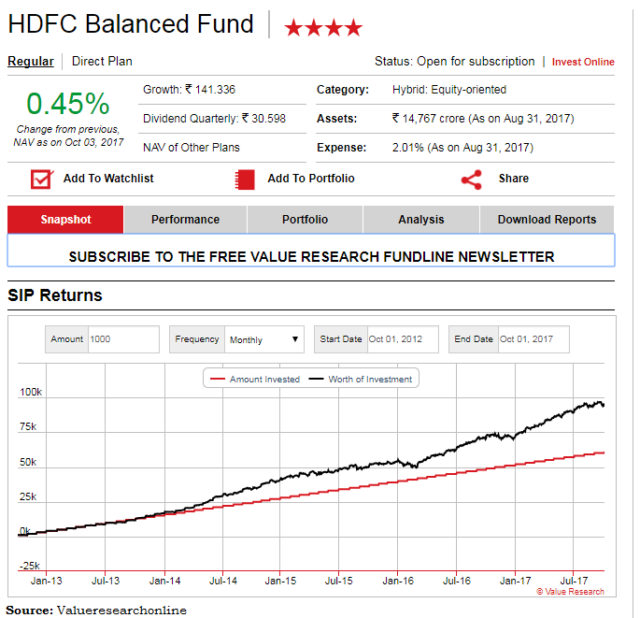 The benchmark of this fund is S&P BSE 200 which gives a return of only 13% over a period of 5 years. Minimum amount of SIP is Rs 500 to invest in this fund. The fund has generated a return of 17.6% return since its launch. The asset size of Rs 5256 Cr proves the investors’ confidence and belief on the fund. L&T India value fund has 4.35% of its asset in Reliance Industries. HDFC, ITC, ICICI Bank, Future Retail are the other major stocks in which the fund has invested its money. This fund is a multi-cap fund which invests in the Indian companies with high potential for growth. This fund has generated more than 20% return over the last 5 years whereas the benchmark index Nifty 500 has generated return of 13.7% over 5 years. The continuous performance of the fund has ensured an asset size of Rs 6851 Cr. If you have invested Rs 1000 per month for last 5 years, you would get Rs 1.01 lakh by today. You can start an SIP with as minimum as Rs 500 in this fund. 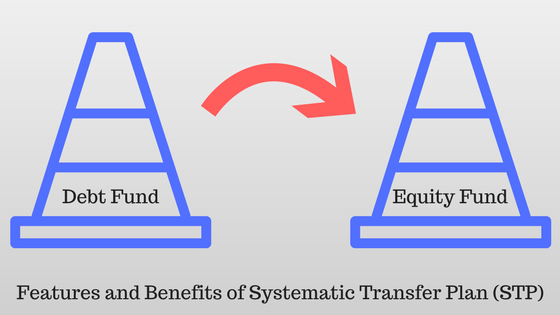 The exit load is 1% for redemption of the fund within 2 years of investment. The expense ratio of the fund is 2.36%. The fund has maximum holding (30% of asset) in the financial sector with SBI, HDFC Bank, ICICI Bank and Axis Bank. The other sectors are Automobile, Energy, Communication, Consumer durables etc. on which the fund invests the money. 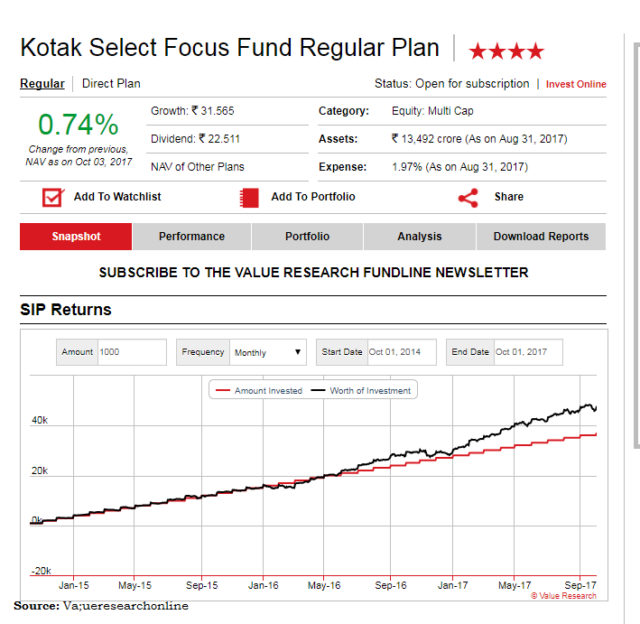 The objective of the Kotak Select Focus fund is to generate long term appreciation from the portfolio of equity and equity related sectors, generally focussed on few selected sectors. The fund has set its benchmark as Nifty 200. The fund has generated more than 20% return over the last 5 years and continuously beat the benchmark. The investment of Rs 1000 per month for 5 years is now Rs 1.01 lakh. The return which the fund has generated since the launch is 15.3% in its 8 year history. The minimum amount of SIP is Rs 1000 and exit load is 1% if you redeem the investment within 1 year of investment in the fund. HDFC Bank is the maximum holding of the fund with 6.7% of the fund portfolio. It has also invested in Reliance Indusries, Hero Motocorp, ITC, SBI, L&T, Maruti Suzuki etc. 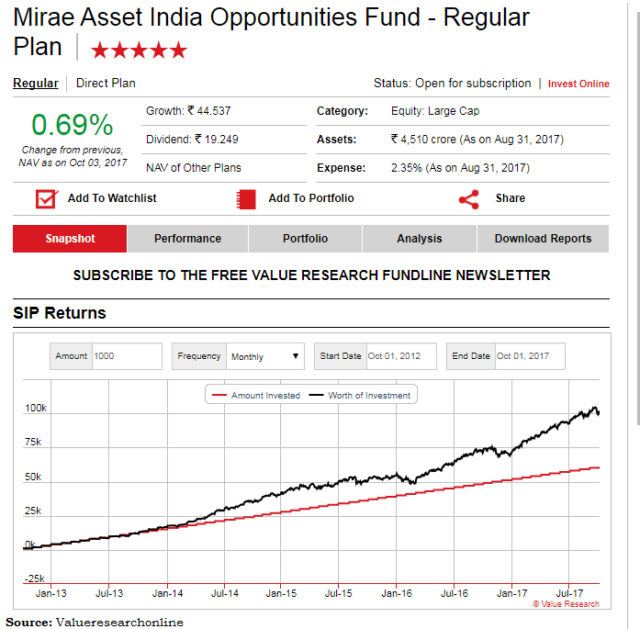 Mirae Asset India Opportunities fund invests in the equity or equity related securities for long term capital appreciations. The fund has sound track record of giving return to investors. It has generated more than 20% return over the last 5 years and beat the benchmark index S&P BSE 200. The monthly investment of Rs 1000 for last 5 years can give you the return of Rs 1.04 lakh today. The expense ratio of the fund is 2.35%. The fund has created an asset of Rs 4510 Cr over the last 9 years and has also generated return of 17% since its launch. The fund has the highest holding in HDFC Bank. ICICI bank, HDFC, L&T, SBI, Infosys and Grasim Industries are the other stocks in which the fund has fair amount of exposure. SBI Bluechip fund invests in the stocks which has market capitalisation of more than the lowest market capitalised stock present in the S&P BSE 100 index. As the fund is investing in large cap stocks, the risk is lower than the funds which are investing in the mid cap and small cap stocks. The fund has generated a return of 18.2% in last 5 years. The minimum investment is Rs 500 in SIP mode and Rs 1000 for lump sum investment. 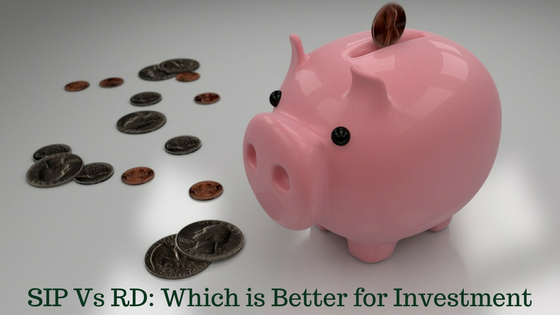 You have to shell out 1% as exit load if you redeem the fund within one year of investment. The expense ratio is very less 1.97% of this fund. The Asset under management (AUM) is now Rs 15,570 cr (in 11 years) which shows that investors are continuously believing and investing on the fund. It is well diversified in terms of portfolio holdings. The fund has invested in financial, construction, Automobile, energy, chemicals etc. HDFC Balanced fund invests the money into equity & equity related securities as well as debt and money market instruments. As the balanced fund invests in debt products the risk is less than the pure equity fund. The fund has generated a return of 17.7% over a period of 5 years. It has a very good track record of performing well. The fund has been started long back in the year 2000. The return since launch is 16.8% and it has asset size of Rs 14,767 Cr. If you have invested Rs 1000 in an SIP 5 years back you would have got Rs 95,000 by now. The expense ratio of the fund is very low i.e. 2.01%. You can start SIP with Rs 500 only. The exit load of this fund is 1% for redeeming within 1 year of investment if the redemption is more than 15% of the investment. It has equity exposure in stocks of HDFC Bank, L&T, ITC, Reliance Industries etc. and debt holding in well-known securities such as Zero Coupon Bonds of Tata Sons, GOI Securities etc. Birla Sunlife Frontline Equity Fund is a large cap fund which invests the money in equity diversified across various industries. The benchmark has been set as S&P BSE 200 index. The fund has given a return of 17.6% for the last 5 years. The monthly investment of Rs 1000 per month in SIP of this fund for last 5 years will fetch you Rs 93,000 now. As it invests only in the large cap stocks the risk reward return is less compare to mid and small cap funds. The fund has been started in August 2002 and now it has the AUM of Rs 18,948 Cr. You can easily guess the investors’ belief and confidence by the large AUM size. Maruti Suzuki, ICICI Bank, HDFC Bank, Infosys, ITC are the major stocks which are the key holdings of the fund. 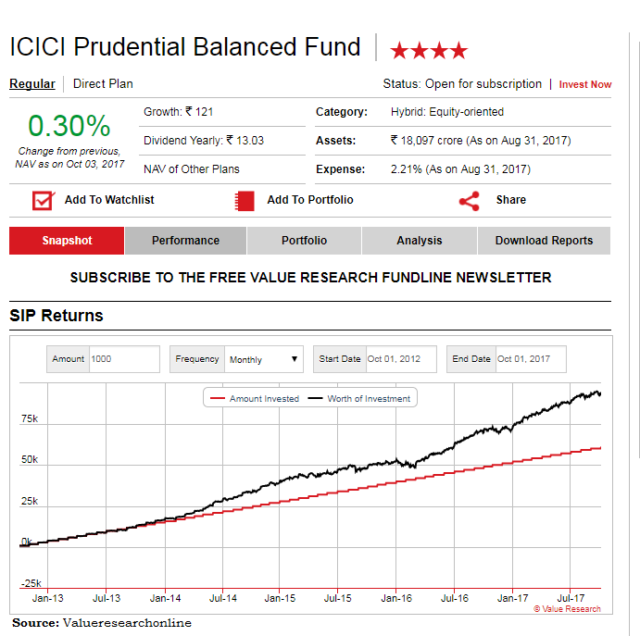 ICICI Prudential Balanced Fund invests the money into equity as well as debt like other balanced funds. It invests in fixed income securities for debt allocation. The fund has generated a return of near about 18% for 5 years. The expense ratio is 2.2% for the fund. The minimum amount to invest in an SIP is Rs 1000. If you want to invest in lump sum the minimum amount is Rs 5000. The monthly investment of Rs 1000 for 5 years give you approx. Rs 93000 now. The fund has a whopping asset of Rs 18097 Cr. ICICI Bank, NTPC, Infosys, Bharti Airtel are among the top stocks which are in the fund’s portfolio. The fund has bonds from HDFC bank, ICICI Bank etc. as a part its debt holdings. So here is the list of Top 10 best Mutual Funds for SIP to Invest now. Share your thoughts and experiences with these funds in the comment box. If you like the article do share with your friends and colleagues via Facebook, Twitter etc.